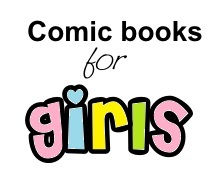 Comics for Girls - Oh So Girly! Archie comics are really famous in America but are perhaps less well-known in other countries around the world. These brightly colored, happy, fun cartoons feature a regular gang of 16-17 year old teens and follows their romantic adventures as well as more day-to-day events. Not all Archie comics are labelled “Archie”. The range includes “Betty and Veronica” and “Pals and Gals” amongst others. Archie comics also sometimes contain short stories from other comics like Sabrina the Teenage Witch, Cheryl Blossom and Katy Keene (a fashion model character). These comics have a sweet “goody goody” feel, trying to teach good morals in places and is generally good clean fun. You can find Archie comics on Amazon.com by clicking here. Or click here for Archie comics on Amazon.co.uk. As a young girl I really enjoyed reading my mum’s old Harvey Comics classics, and above all the Little Dot comics. Little Dot is a cute girl who loves all things polka dot! It’s a sweet comic suitable for a younger audience. Along a similar vein were Richie Rich comics which were also great fun to read when I was little. The highlighted text links to Richie Rich comics on Amazon.com, and to find them on Amazon.co.uk click here. For one of my birthdays a couple of years ago (I was already an adult!) my brother got me a big book full of “True Story Swear to God” comics (the one he got me is the one linked to if you click the picture). And I absolutely loved it! It is an autobiographical true story of the author’s life, and more specifically about his love life. His story is really romantic, feel-good and sweet and I loved the drawing style too! I think this comic series would appeal to teenage girls and adults. It is another one I would recommend whole-heartedly. You can find True Story Swear to God on Amazon.com by clicking here. And it’s available on Amazon.co.uk by clicking here. I recently discovered the adorable comic “Soppy: A Love Story” by Philippa Rice. It’s not really a story so much as many cute drawings of every-day humorous moments from the author’s real-life relationship with her boyfriend. It’s quirky and funny (in a gentle, subtle kind of way); it’s extremely cute and I thoroughly enjoyed it. Japanese Manga comics are a whole genre of comic books, many of which are tailored for girls, and Fruits Basket is one of these. I think this comic is suitable for girl teens and adults alike. You can find Fruits Basket in comic book on Amazon.com by clicking here and you can also get it in DVD form here. Fluffy by Simone Lia is a comic book about a man and his adorable talking bunny; a bunny that really acts more like a toddler. Since the bunny (Fluffy) is the star of this graphic novel, and since he is a toddler, it means that the book can feel a little bit like a children’s book, but at the same time, the underlying story is about Fluffy’s adult owner (Michael) and is therefore for adults. I recently read this comic book and I think you may like it if you have a very unique sense of humor – the kind of sense of humor where you smile when children say silly things or when a child makes a potty-humor joke. Also if you like “randomness” you’ll like this comic book. I thought it was a cute story and I completely felt like giving Fluffy a great big hug at various points throughout the book! The only reason why I categorise this comic as “non-girly” is because it is more on the humorous-drama side than anything else. There is no real love story and the main characters are all male. You can purchase Fluffy on Amazon.com here or on Amazon.co.uk here. The Beano is a British comic book that contains many short stories (each between one to four pages long). Each short story features a different regular characters and instead of being girly girl-ish, it contains more unisex, entertaining, funny stories about children getting up to all kinds of mischief. My favorite was always the smart alec “Roger the Dodger” who found ingenius ways of getting his way. 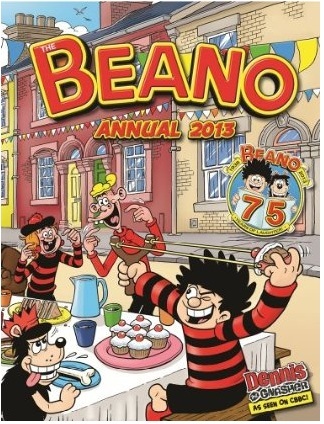 Perhaps the most famous characters in the Beano are “Dennis the Menace”, who always wears a red and black stripey jumper, and his dog Gnasher. There are even some girl stars in the Beano including “Minnie the Minx” and “Ivy the Terrible”. For parents who worry that minxes, menaces and “terribles” may not be a great influence on their kids, I can only give myself as an example: I was one of the best behaved kid you could get when I was growing up and reading these comics with my mum didn’t make me terrible in the least. :) It really only served to get me interested in reading. The Beano comes in weekly short paper comics or in yearly annuals which are thicker and often in hard-back. The Dandy is very similar to the Beano in character. It is also British and has a range of characters that appeal to both boys and girls. It’s targeted for the younger audience rather than for adults, and as a child I really enjoyed reading the Dandy. You may be able to find a copy of a Dandy on Amazon.com here or more likely it will be found on Amazon.co.uk here.